Skunk removal from Sande Wildlife Control on Toronto’s www.homestars.com local contractor pages – we are rated 10/10 by our past clients in the ‘Skunk removal services’ category. And everyone finds the prices very affordable. Skunks are cute in the cartoons but not quite so appealing in real life especially when they show up on your property in Toronto and Mississauga. And it is almost as bad if the skunk sprays your pet dog or your fence post or anywhere in the vicinity. And skunks can also cause a problem with their digging up of your yard, too. The solution is to get rid of your skunk guest just as soon as you can – which is where Sande Wildlife Control of Toronto can be of assistance. Telephone: 416-902-6249 or e-mail: st.wildlifecontrol@gmail.com or contact us online. Sande Wildlife Control: we offer humane skunk removal and control services for residential, commercial and industrial properties in Toronto, King City, Stouffville, Caledon, Mississauga, Richmond Hill, Thornhill, Markham, Whitby, Ajax, Brampton, Vaughan, Maple, Scarborough, Etobicoke, Pickering and throughout the GTA. At Sande Wildlife we use humane baited traps to capture and remove your skunks when necessary. Skunk removal is best done by evicting them out of their dwellings. Our traps have solid side panels so our trappers do not come into contact with the spray, and nor does it get sprayed all over your back yard while we are in the process of removing them. If we find baby skunks, we first remove them from the nest and then evict the mother from her den. Once the mother is outside her den and locked out, she will relocate her young elsewhere. Before leaving your premises, we will seal up all entry and exit points to make sure that no other skunks or different species of wildlife pest get past our work. What attracts skunks to your property in Mississauga? Female skunks often set up home under sheds, porches, decks, etc, where they can be warm, dry and offer shelter to their young, and where there is a ready source of food available in the form of spilled pet food, open garbage cans, lawns full of worms and grubs just waiting to be dug up, etc. They give birth to litters of up to six offspring in late spring which live with their mothers for up to a year before leaving to fend for themselves. Many skunk young die during their first winter, but if they survive they can live up to five years (more in captivity). As with many animal pests, it is often far easier to take preventive measures to discourage skunks from choosing your premises as a nesting site than it is to get rid of them once they decide to move in. Skunks have extremely poor eyesight and are not good at climbing. So if you keep your garbage cans tightly closed and weighted down so they can’t be knocked over, clean up all spilled pet food immediately after your animals have finished eating and get rid of termite and ant mounds (insects make a tasty meal for skunks!) you will be doing a lot to discourage skunks from staying in your yard. If the skunk can find nothing to eat at ground level it will soon move on to more hospitable surroundings. If skunks are a frequent pest in your Mississauga, Whitby, Thornhill, Richmond Hill, Ajax, Stouffville, King City, Caledon, Maple, Markham, Pickering, Etobicoke, Scarborough, Brampton, Vaughan or other downtown Toronto or GTA neighbourhood, you may want to think about installing an exclusion barrier around your deck, shed, porch or basement and window wells to keep them out. 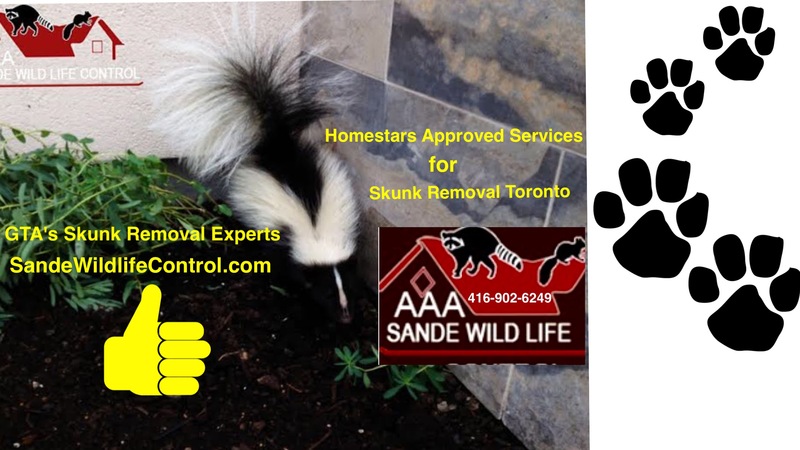 If you would like experienced, professional and affordable Skunk removal, please call Sande Wildlife Control today on 416-902-6249; e-mail: st.wildlifecontrol@gmail.com; or contact us online. Sande Wildlife Control: Skunk removal and other wildlife pests throughout Toronto and the GTA. Click on testimonials to find out what our previous clients think of our services!